For many parents and guardians of Windward students, Maureen Sweeney was the first person they encountered when they stepped through the doors of The Windward School. After 39 years of tireless dedication to thousands of students and their families, Maureen A. Sweeney, Director of Admissions and Assistant Head of School at The Windward School, has announced her retirement effective June 30, 2018. We are indebted to Ms. Sweeney for her devoted service to The Windward School community. With her sharp intellect, incredible work ethic, and generous spirit, she has enriched the lives of all who have had the good fortune to know and work with her. Ms. Sweeney’s impact on the lives of Windward students and families is immeasurable. A parent once said, “I remember Maureen Sweeney as one of the first people to really ‘get’ our children and what they needed educationally.” The entire Windward community is grateful for the wisdom and expertise Ms. Sweeney has imparted to everyone. As described below, you can participate in celebrating Ms. Sweeney’s retirement in a number of ways – by writing a personal message to her that will be included in a bound book of remembrances, by joining us for a celebration in her honor that will be held on June 15, or by making a gift to the Maureen A. Sweeney Fund for Financial Aid. I hope you will join us in honoring Ms. Sweeney. Shhh...it's a secret! We are compiling notes and letters to be included in a bound book for Ms. Sweeney. Over the years, parents, students, and alumni have sent messages thanking her for her work. This is your chance to put all of your thoughts in one place. Please join Dr. John J. Russell, Head of School, and the Board of Trustees in honoring Ms. Sweeney's 39 years of service. Comments by Dr. Judith C. Hochman at 7:00 p.m.
Ms. Sweeney spent countless years in the admissions office finding the perfect students for Windward’s program. Many times during her tenure, she spoke at board meetings about her frustration and sadness for families whose children needed access to a Windward education, but even with financial aid, were stretched to the breaking point by tuition. 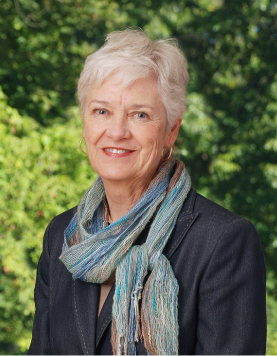 It has been a long-time goal of the Board of Trustees to provide more financial aid, and in honor of Ms. Sweeney’s retirement, the trustees have created the Maureen A. Sweeney Fund for Financial Aid. If you would like to make a gift to the fund, please make a gift at thewindwardschool.org/give.